Tuscan terracotta-aged wine surprises wine enthusiasts: a small amount of IGT wine from the last grape harvest aged in terracotta urns has revealed excellent results. This year too, Fattoria Montecchio will be present at Vinitaly, the largest international exhibition dedicated to wine. From 6th-9th April in Verona, the Fattoria Montecchio will present many new features at its stand (C4 – Pavilion 9, dedicated to Tuscany). 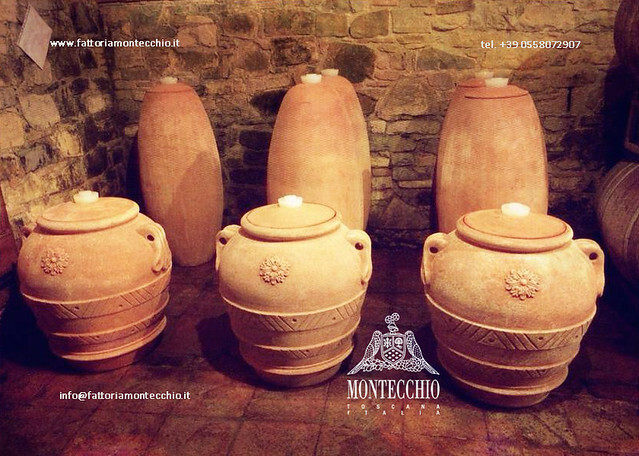 The first innovation of great interest is a small production of IGT from the last harvest that ages in terracotta amphorae made onsite at the furnaces of Montecchio. For this production maceration takes place in 20 ton pitchers, the aging in 180 litre amphorae and the subsequent bottling and aging in the bottle. The beauty of the forms of this hand-made artistic pottery combines perfectly with the qualities of this ancient material that set in the Tuscan land of Montecchio and its surroundings, reveals exceptional qualities. From these properties the commercial and cultural promotion of this new product starts, which comes from a skilful combination of ancient traditions, expertise and today’s knowledge. Among the other new features that the Fattoria Montecchio will be presenting is their meticulous restyling, from the wine labels to the website, from the enoteca or wine bar to the surrounding gardens and to the apartments of the agritourism farm, La Papessa. Under the direction of the Nuti family, the Fattoria Montecchio is redesigning its company profile. The vineyards, olive mill, furnace and agritourism farm all play a fundamental role at the Fattoria Montecchio, a traditional producer of Chianti Classico, making it a 360° company well-established in the area and one of excellence in Tuscany. On the new stand at Vinitaly 2014, redesigned according to the image restyling guidelines that cover every aspect of communication at Montecchio, wine tastings of the latest vintages will be offered: wines that never fail for their quality and have been recognised by the recent medals awarded in international competitions, including Decanter and Mundus Vini. The last harvest of Ponentino will be reoffered, a rosé wine made of 100% Sangiovese grapes. At the most qualified and looked-to annual reference point for the international promotion of wine, where the latest trends always emerge, Montecchio excels as a synthesis of tradition, originality and avant-garde.